In the UK, the Merchant Shipping Act of 1854 placed a statutory obligation on the master of a merchant vessel to submit crew lists and a log book every six months. If the voyage lasted more than six months, a submission was required when a vessel ended its voyage in a UK port. Among other information required to be reported in a vessel’s log book, the master summarily noted births, marriages and deaths of the crew and passengers. Collisions, disciplinary offences and medical matters were also recorded. The Board of Trade’s Registrar General of Shipping and Seamen retained all the crew lists and accompanying log books submitted to it. From 1860 onwards, most of the crew lists have survived. To save storage space, some log books were disposed of in the nineteenth century unless needed for possible legal purposes. Many of the log books that specifically recorded births, marriages and deaths were expressly retained and provide an extensive source of basic information about existential events on merchant vessels in the second half of the nineteenth century. The study has been prepared by examining the contents of 92 archive boxes of crew lists for 1865 and any accompanying log books held in the National Maritime Museum (NMM) for the same year. The 92 boxes represent 22% of the total crew lists (411 archive boxes) held by NMM for the year 1865. The boxes were drawn from near the start and about the middle of the range of vessels’ official numbers (that is 3631 to 6882 and 24941 to 33883 out of the run of 001 to 54527). There is little obvious reason why this sample should not be considered indicative of NMM’s entire holding of log books for 1865, thus the results are likely to be illustrative for that year. This study does not, however, take account of any crew lost in ships that foundered. Total loss of life at sea could well be greater than these figures suggest. Log books were checked for any obvious mention of deaths or births. As there was a legal obligation on masters to record these events, they were apparently careful to do so. Many of the log books carry evidence that office clerks meticulously checked the masters’ entries. In cases where they discovered an omission, they demanded that the master sign a letter acknowledging the oversight and undertaking to guard against similar infractions in future. Such letters are pinned inside the relevant log book. 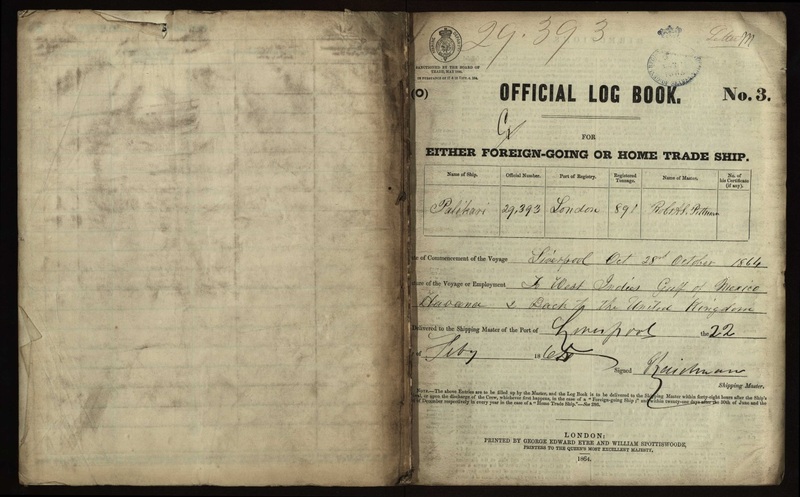 Logbook entries recording deaths and births are often initialled by a clerk and/ or have the date they were recorded written conspicuously in the margin. The sample contains one or more crew lists for 4,141 vessels. A log book exists for 405 of these vessels or approximately one in ten. Although not every log book records a death, 86% record one or more deaths. Thus roughly 8% of all vessels record at least one death. Crew members were most at risk. 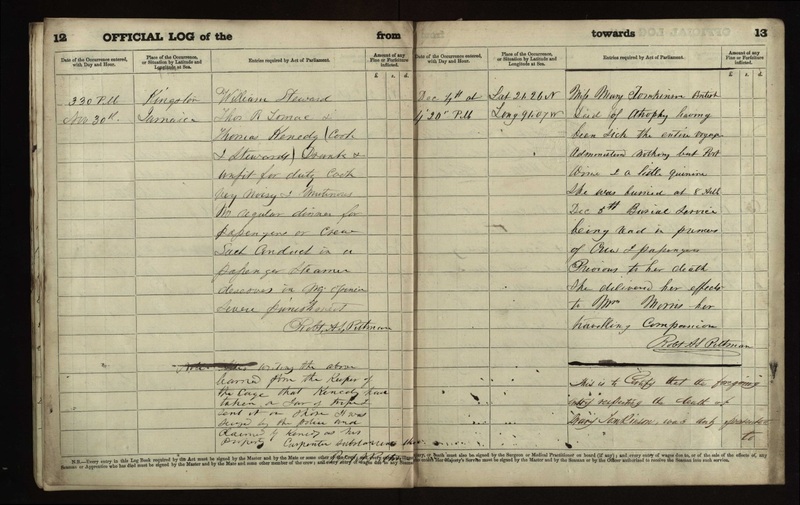 Of log books recording a death, the death of a seaman features in 88%. Passenger deaths are present in 11% and death of a master features in 5% of these log books. Some of the passenger deaths relate to infants. These figures add up to more than 100% because some log books may record deaths of a crew member and a passenger on the same voyage. Serving on a merchant vessel in 1865 was a high risk occupation for the crew. It would be possible to carry out more research on the type of death being recorded, however in broad terms, disease or accidents account for the largest portion of deaths. Typhoid, dysentery, cholera, yellow fever and malaria are often cited as the cause of death for seamen on vessels visiting tropical zones. Some of these cases occurred when a vessel was in harbour and the ill man was transferred to a local hospital. At the time medical treatment was rudimentary and had little chance of influencing the outcome. Accidents on a vessel also claimed a large number of lives. Falls from the rigging are described, with death resulting from injuries sustained by landing on deck or from drowning as a seaman fell in the sea. Occasionally a crew member was washed overboard in high seas with slim chance of recovery. Other accidents are also recounted. This figure of 8% of vessels losing one or more crew members compares with 0.4% (or 1 in 250) for vessels losing their master. Thus the risk that a vessel lost one or more of its crew members was 20 times greater than the probability of a master dying during a voyage. As some vessels lost more than one crew member, but none lost more than one master, the risk of death for a crew member was in fact at least 20 times greater. Not yet investigated by these records is the average size of crew. If crews numbered on average say 20, then the risk of death would be the same for a crew member as for a master. If the crew size were smaller, then a crew member’s risk of death exceeds a vessel’s master. If the average crew size were larger than 20, a master would be at greater risk of dying on his vessel during a year than a member of his crew. As crew members typically performed more hazardous duties than a master, such as climbing the rigging in a gale, it would be reasonable to hypothesize that their risk of dying was materially greater than that of their vessel’s master and so the average size of crew was meaningfully smaller than 20.